Encouragement is something that doesn’t seem to need any explaining. Real encouragement looks beyond who you are though. Being the encourager that we are called to be can be a daunting task when you really look at it. Encouragement is not the cheerleader that we all think. It’s not JUST the person sitting on the sidelines giving praise and guidance. Courage means to inspire others with hope and confidence. You can’t just tell someone that they can do it. You have to make them feel that they can. Only then can they see past their limitations and see the possibilities. Real courage looks beyond the “I”; the self. You must focus on the outside self. You cannot serve others if you are only focusing on self. In order to grow encouragement you must first give unexpected affection. As a stay at home mom I am around my kids ALOT. How often do you go through your days and the frustrations and mundane tasks just seems to pile into a mountain and you can’t believe that you have ANOTHER load of laundry to do or ANOTHER pile of dishes in the sink. Have you ever felt this mounting pressure and unexpectedly your child gives you a kiss or a lingering hug. Doesn’t that just melt your heart and all of the pressures seem to float away. That little bit of encouragement from our child shows us that we are not alone. Where can you give affection to others that need it? Second, you must provide words of praise. Tell your spouse, “I appreciate you” or your child, “You did good”. Think about what inspires you when other people encourage you. Return that encouragement with honor. Third, acknowledge people to show their importance in your life. Actions speak louder than words. As a stay at home mom it’s easy to be focusing on dinner or other duties when my family walks in the door. How encouraged would people feel instead if I greeted them at the door and asked how their day was rather than shouting a hello from across the house? How would you feel if you were personally greeted like that? Fourth, PRAY. Prayer changes your heart and attitude towards other people. There is no simpler way to say it. If you have been at a low point in your life and someone tells you that they are praying for you, what does that do to you? For me, it encourages me to keep pushing through. That this will pass and there will be brighter days. If you use ALWAYS or NEVER in your statement, you are treading dangerous ground. “You NEVER help me around house.” “You ALWAYS choose other things before me.” Be careful what you say to someone else. Most often, these words don’t encourage. Our tongue is the most offensive weapon that we as Christians possess. Truth, peace, righteousness and salvation are more than words. Learn to apply them. You’ll need them throughout your life. God’s word is an indispensable weapon. How are you using your sword? If you speak positive words, make sure that your body language matches what you are saying. People will notice if what you say does not correspond with how you say it. How can you be a better encourager? It’s a known fact that it takes 3 weeks to learn a new habit and in order to make that habit a natural part of your day it takes six weeks. This is not something that you can just change overnight. 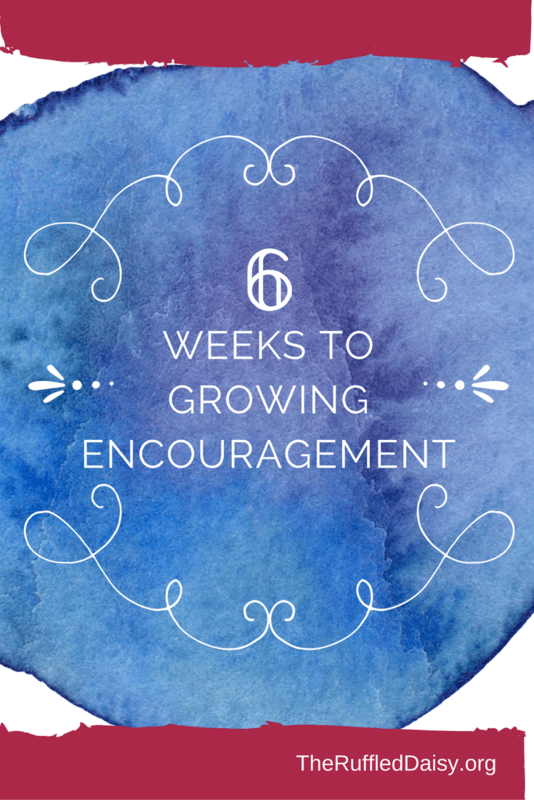 Here is a week by week plan to help you on your path to being a better encourager. Week 1 – Focus on committing to say nothing but good, positive, uplifting things to people around you. Week 2 – Continue with positive words and say a prayer of encouragement for a person. Week 3 – Continue with positive words, prayer and choose one activity that another person needs for encouragement. Week 4 – Continue with positive words, prayer and add touch – such as a hug. Week 5 – Continue positive words, prayer, and touch. Support a person in a dream or activity that they have. Week 6 – Continue positive words, prayer and touch. Make them a priority. Look at them when they are talking to you. Show them that they have your full undivided attention. There should be nothing that interrupts your focus on them at that moment. Being an encourager will allow God to become a greater part of your life. Encouragement is the sister of love. Encouragement leads to a joy of peace and joy. Are You Caught In The "Do It All" Syndrome?